The European Organization of the Sawmill Industry participated in the biennial session of the Committee on Forestry (COFO) – the highest FAO Forestry statutory body – which was held in Rome on 16-20 July 2018. The Committee brings together heads of forest services and other senior government officials to identify emerging policy and technical issues, to seek solutions and to advise FAO and others on appropriate action. During the meeting it was emphasized that Forests are essential for meeting the 2030 Agenda objectives ranging from tackling climate change to conserving biodiversity, reducing inequalities and improving urban habitats. 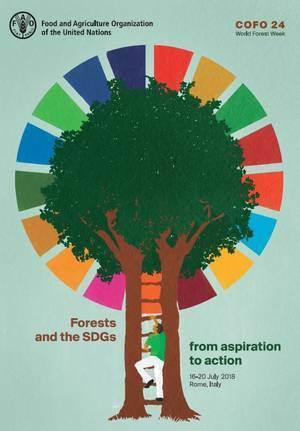 The FAO in the State of the World's Forests 2018 was also discusses: the report emphasizes the importance of clear legal frameworks regarding forest tenure rights, welcomes the growing trend to strengthen local governance, and calls for effective partnerships and private sector engagement to pursue sustainable goals. The 24th session of COFO and the 6th World Forest Week explored the contributions that forests can make to the achievement of the Sustainable Development Goals (SDGs) and other internationally agreed goals; explored ways and means to accelerate progress, in particular, towards Goal 15 (Protect, restore and promote sustainable use of terrestrial ecosystems, sustainably manage forests, combat desertification, and halt and reverse land degradation and halt biodiversity loss). It also discussed actions for implementing the policy recommendations of the Committee on World Food Security regarding the contributions of forests to food security and nutrition; reviewed opportunities and challenges for urban and peri-urban forestry; considered the implementation of FAO’s climate change strategy and specific tasks related to forest resilience, health and forest fires; and provided strategic direction for the future work of FAO in forestry. Further information on the COFO meetings is available HERE.